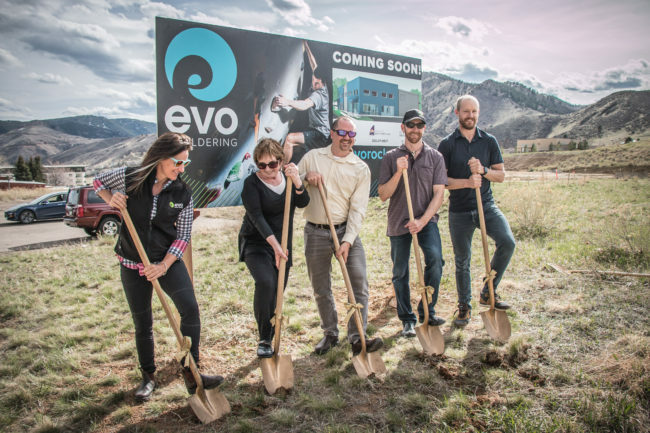 EVO Rock + Fitness, with locations in Louisville, CO; Portland, ME and Concord, NH broke ground with Kodiak Real Estate Group for their next location in Golden, Colorado this past Monday, April 8th . The gym will be a bouldering only facility featuring training boards, creative routesetting, a personable crew and an inclusive vibe. The Golden location will be just under 11,000 square feet. Members will have the option to use the larger facility in Louisville if they are looking for more extensive terrain and offerings. EVO Bouldering – Golden is aiming to open in the winter of 2020.